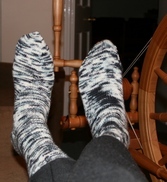 The yarn is a slightly heavier than regular sock yarn that I knit in a ribbed pattern for boot socks. 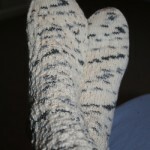 Knit with Opal yarn in one of the this years striping patterns, I love the fit and look of these socks. 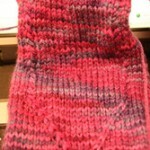 The basic pattern is by Jen Showalter and can be found here . 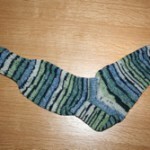 This is an Opal yarn that I have had since (at the latest) 2000. 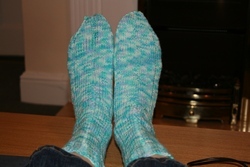 One sock is knit longways from the original Opal sideways pattern. 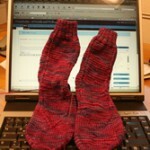 I don’t care for it, so I knit the second as a normal sock. That is not to say that I don’t like the colour, I just don’t like the back and forth. Once you have grafted something like this, it will never bother you again. Take a ball of Cherry Tree Hill Merino yarn. Place tiny twisted stitch cables down the sides and a 3 strand braid down the back. 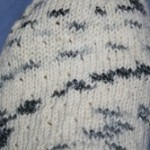 Now have the pattern come together on the top of the foot. 65 stitches on 2,0mm needles. 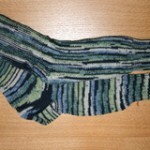 Having knit myself that wonderful Kauni sweater – Mein Weg – I needed some socks in either dark purple or blues and purples. This yarn was the closest I could come out of stash on hand. 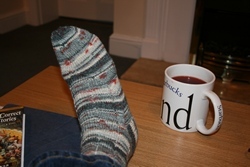 Knit in wider rib over 56 stitches, I am messing around with the arch-shaped foot till it is perfect for my feet. 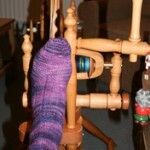 Just a lovely Merino yarn from Fleece Artist. 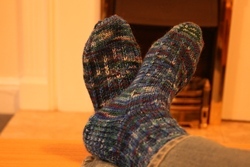 Slip Stitch pattern and a comfortable fit. 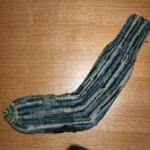 Sale Yarn – Trekking XXL that I bought from an online German merchant for a really great price. Loud, you might say, and I would agree. 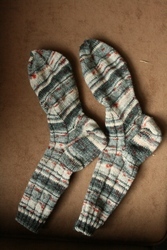 Knit over 56 stitches, it combines slip stitch with Jen Showalter’s great arch shaped foot.